Each month, we go through Instagram looking through all of your beautiful photos with the #MyUrbanBarn tag, looking for someone to feature on our blog (and to send a $150 UB gift card). This month’s winner is Linda, aka Madison Lane Designs on Instagram. Tell us a little bit about yourself and your space. My name is Linda Stewart. I’m the owner and senior stylist for Madison Lane Designs, est. in 2006. We specialize in turnkey properties. Our services include colour, interior designs, redesigns, real estate staging and shopping…lots of shopping! My clients purchased this property for the lake view frontage of 600 feet on beautiful Lake Muskoka with the intent of replacing the old cottage with a new build. We were hired to make the space livable and comfortable for them temporarily, while plans and permits were in the works for their new cottage. Paint is the least expensive upgrade and made a world of difference by brightening up the whole cottage. We painted everything one colour first, then started our space planning and shopping. My clients wanted a sofa that the whole family of 5 could sit on. I wanted clean lines and something low profile. The girls from Urban Barn Barrie graciously sat on the sofa of my choice for a photo so I could send to my clients. They loved my selection. So much so we ordered two. The other one is located in the sunroom. 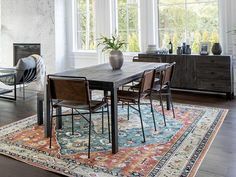 I was also able to find many other pieces for this room from Urban Barn including all the tables, art and accessories. It all came together perfectly. Needless to say, my clients fell in love with what we did with the existing cottage and have postponed the new build for at least a couple of years. I personally love mixing old with new. I had an antiques and collectibles business for a few years and loved the whole trash-to-treasure concept. I am all about refurbishing things and can see the possibilities in almost every piece I have come across. I have been a garage sale junkie for years. I prefer neutral pieces that will remain timeless and bring colour into a space with accents. It’s much easier to change out your pillows than a big piece of furniture. Tell us about your favorite Urban Barn piece and why you love it. I absolutely love the Crosby Tuck Side Table – Sheesham. In fact, I found a spot for three in this cottage alone. One in the living room as shown, one in the master bedroom and one in the sunroom. It fits anywhere, is lightweight and easy to move, and the wood/metal mix can be tied into any decor. Which pieces were featured in your winning image? Which Urban Barn location is your favourite to shop at and why? Urban Barn Barrie! I love all the girls at the Urban Barn store in Barrie. Not only are they always so helpful, they always look so good. I love checking out the latest fashion trends and furniture trends at the same time. I come into the store wishing to have one of everything sometimes. #MyUrbanBarn Contest: Post a picture of your favourite Urban Barn products in your home to INSTAGRAM using the hashtag #MyUrbanBarn for your chance to win a $150 Urban Barn gift card! A new winner is chosen each month! Is the table runner from Urban Barn?